No, it's not a cake, brownie, cookie, tart or a pie. I actually do eat regular food for dinner. Really, I do! Ok ok, I've been know to have a fat slice of pie accompanied by a heaping bowl of strawberry ice cream for dinner....but not every day. I promise. 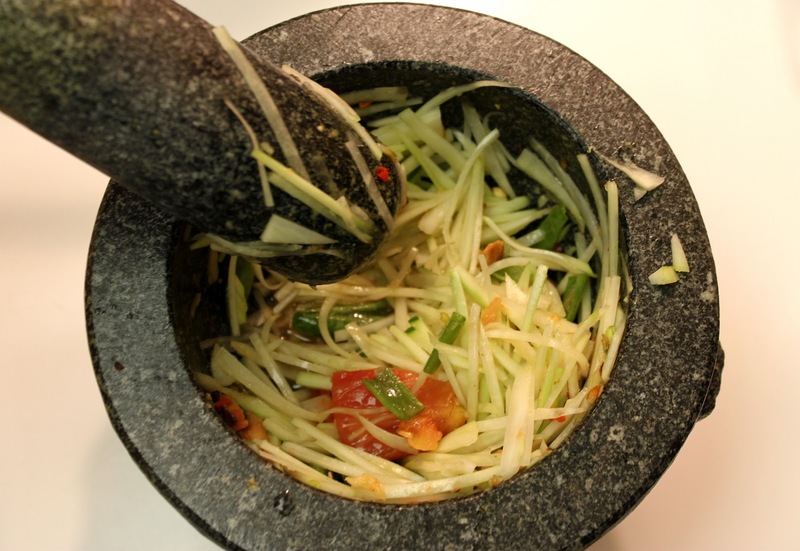 It's Green Papaya Salad! It's salty, sour and sweet...and perfectly balanced. It's the most delicious salad that could ever be fat-free! There's no oil, but there's so much flavour. Put garlic, chili and half of the peanuts in the mortar and pound together until chili and garlic are smashed up well. Add beans and shrimp and pound a couple of times until just broken. Add tomato and pound gently. Add lime juice, fish sauce and palm sugar and pound until sugar dissolves. Add papaya and pound gently while tossing with a spoon in the other hand until well mixed. Crush or coarsely chop remaining peanuts and sprinkle over salad just before serving. Eat immediately. I'll be sure to try this out. Thank you for sharing this recipe.